As millions of residents and visitors from around the South will tell you, Christmas in Georgia holds happy memories of charming old traditions mixed with hi-tech holiday spectaculars. 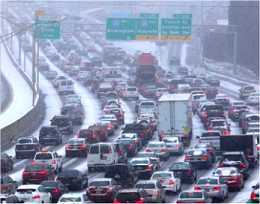 • Folks still talk about December 25, 2010 that saw Atlanta blanketed in 1-3 inches of snow. It was was the city's first white Christmas since 1881. • James Lord Pierpont, an organist from Savannah, Georgia, first performed a song he wrote, "The One Horse Open Sleigh," at a Thanksgiving concert at his church in 1857. The song was later published in 1859 and retitled ... "Jingle Bells". • Every year, Atlanta's largest gingerbread house at the St. Regis Hotel is made from a recipe that includes 300 pounds of flour, 100 pounds of sugar, 70 pounds of shortening, 45 pounds of corn syrup, and 16 pounds of molasses. The life-size confection is then decorated with over 300 pounds of icing, figurines, poinsettias, and candy. Georgia's Signature Holiday Events - Check out this year's holiday traditions from Atlanta to Savannah, from mid-state to the coast -- with holiday happenings including complete details, dates and schedules. Atlanta Christmas and Holiday Events - Here's the main holiday schedule including the lighting at Lenox Square, the Botanical Garden, Centennial Olympic Park, Callaway Gardens, and more. Stone Mountain Christmas - With mounds of snow on the laser lawn at Stone Mountain, also catch the regularly scheduled snowfall & fireworks, live shows, the Polar Express 3D Experience, and the nightly grand entrance of Santa Claus. Savannah Holly Days - Here's a helpful list of events in November and December with schedule and contact details for the Savannah Theater annual Christmas show. Christmas in Roswell, Georgia - What's happening at Bulloch Hall, Barrington Hall and Smith Plantation Home with the complete schedule of events for November and December. Christmas Tree Farms in Georgia - Here's a comprehensive list of choose-and-cut farms throughout the state with information on related holiday offerings including hay rides and free kid's treats.